A growing body of evidence suggests that psychological factors are — literally — heartfelt, and can contribute to cardiac risk. Stress from challenging situations and events plays a significant role in cardiovascular symptoms and outcome, particularly heart attack risk. 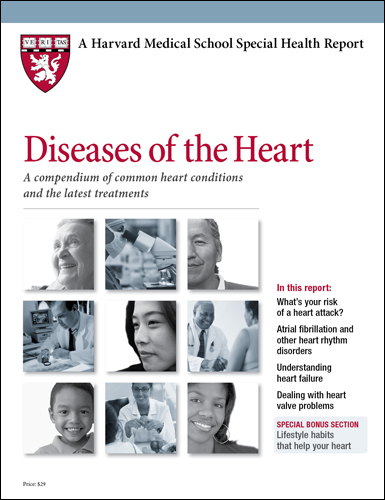 Depression, anxiety, anger, hostility, and social isolation also affect cardiovascular health. Each of these factors heightens your chances of developing heart problems. But emotional issues are often intertwined: people who have one commonly have another. Workplace stress. Women whose work is highly stressful have a 40% increased risk of heart disease (including heart attacks and the need for coronary artery surgery) compared with their less-stressed colleagues. These findings come from the Women's Health Study (WHS), which included more than 17,000 female health professionals. For the study, researchers defined job strain as a combination of demand (the amount, pace, and difficulty of the work) and control (the ability to make work-related decisions or be creative at work). Earlier studies found similar trends among men: one documented a twofold higher risk of newly diagnosed heart disease among men who felt the rewards they received at work weren't compatible with their effort. Financial stress. Heart attacks rose as the stock market crashed, according to a 2010 report in The American Journal of Cardiology. Researchers at Duke University reviewed medical records for 11,590 people who had undergone testing for heart disease during a three-year period, and then compared monthly heart attack rates with stock market levels. Heart attacks increased steadily during one eight-month period — September 2008 to March 2009 — that was particularly bad for the stock market. Caregiver stress. Women who cared for a disabled spouse for at least nine hours a week were significantly more at risk of having a heart attack or dying from heart disease compared with women who had no caregiving duties, according to findings from the Nurses' Health Study. This large study followed more than 54,000 female nurses over a four-year period. Disaster-related stress. Following the terrorist attacks of Sept. 11, 2001, researchers asked 2,700 American adults to complete an online survey of physical and mental health. People who had high levels of stress immediately after the attacks were nearly twice as likely to develop high blood pressure and more than three times as likely to develop heart problems during the following two years compared with those who had low stress levels. Earthquakes also trigger stress-related heart problems — not just in their immediate wake but for years afterward, some research has shown. Sudden cardiac deaths rose sharply immediately after the 1994 earthquake in the Los Angeles area, and hospitalization for heart attacks jumped on the day of the 1995 temblor near Kobe, Japan. A longer-term follow-up of another major earthquake in Japan (Niigata-Chuetsu in 2004) revealed that death rates from heart attacks rose during the three years after the quake compared with rates during the five years prior to the disaster. Get enough sleep. Lack of sound sleep can affect your mood, mental alertness, energy level, and physical health. Exercise. Physical activity alleviates stress and reduces your risk of becoming depressed — and it is good for your all-around health. Learn relaxation techniques. Meditation, progressive muscle relaxation, guided imagery, deep breathing exercises, and yoga are mainstays of stress relief. Your local hospital or community center may offer meditation or yoga classes, or you can learn about these techniques from books or videos. Learn time-management skills. These skills can help you juggle work and family demands. Confront stressful situations head-on. Don't let stressful situations fester. Hold family problem-solving sessions and use negotiation skills at work. Nurture yourself. Treat yourself to a massage. Truly savor an experience: eat slowly, focusing on each bite of that orange, or soak up the warm rays of the sun or the scent of blooming flowers during a walk outdoors. Take a nap. Enjoy the sounds of music you find calming.